I'm a sucker for a boutique gym class, just not how much they cost. So what better way to spend a Saturday doing a ridiculous amount of boutique gym classes for a quarter of the price? Signing up to the Lululemon #Sweatlife festival was exactly this and where I spent last week in Tobacco Dock. 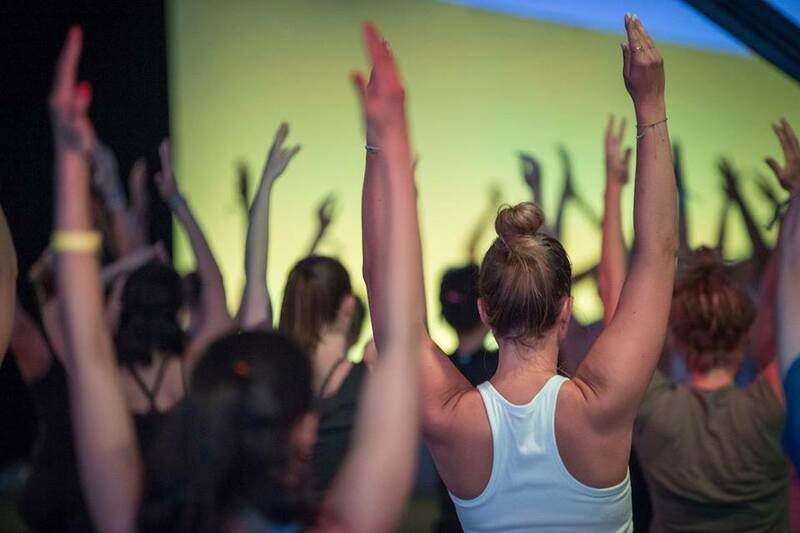 For only £20, it offered a ridiculous range of classes from the best boutique gyms in London, health talks, clean eating stands, brands from vegan candles to track bars and accessories, braiding and makeup bars and ending with a yoga rave. Having signed up early, we got the pick of the bunch which we were lucky with; having spoken to someone who signed up only a week before, they didn't manage to get on any and were waitlisted which would have been disappointing. I chose a morning yoga session to ease into the day, onto KOBOX, then Xtend Barre and then Frame's Beyoncé barre class. Other choices ranged from Psycle to Core Collective which I was also hideously tempted to try and fit in. I can safely say that not only was I exhausted and had a quick nap at the massage zone (which was embarrassingly caught on camera), but the buzz I gained from the varied exercise sessions was insane. Each class itself cost about £20 so the whole day was easily a quarter of what it should have been, and trying them out was such an incentive to sign up. KOBOX was hands down my favourite; having had some punching tips from my ex-kickboxing-champion dad, I already knew how to jab and hook but KOBOX is where boxing meets nightclub. So punching, burpees, press ups and lunges, all in the dark to pounding music. And it's safe to say I felt it in my core and upper arms the next day. The rest of the day passed in a blur, with some delicious, healthy snack pots, a beautiful braiding experience with The Mermaid Cave and ending on the perfect chocolate peanut butter protein shake with Neat which definitely helped me stave off the muscle pain the next day. We couldn't quite face the yoga rave after all; we had worked the equivalent of 4 high-intensity classes in one day after all. However it was amazingly well-organised and full of beautifully dressed Lululemon ambassadors, and something that if they do again will be the first to sign up.